According to historian and professor at the Free University of Brussels David Engels, the EU is currently facing a system change comparable with that in the late Roman Republic. In his book “Le déclin. 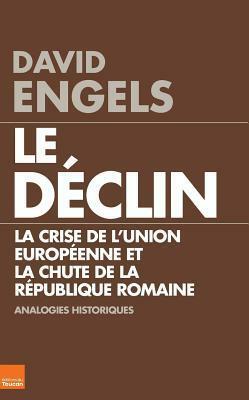 La crise de l’Union européenne et la chute de la république romaine”, he draws historical parallels between the current changes in the EU and the fall of the Roman Republic. In an interview with Sputnik, Engels argued that problems like populism, high unemployment, growing influx of migrants, asymmetric and economic wars as well as the decline of traditional values had already existed in the 1st century BC. Exactly these things have become major challenges for Europe in recent decades. “Over the past few decades, corruption, social naivety and general political apathy of European citizens have sharply increased. Here you can also see clear analogies to the late Roman Republic, where citizens were even ready to accept an authoritarian government — due to poverty, unemployment, loss of values and the civil war — if this was the only way their belongings could be protected,” the expert argued. According to Engels, such tendency could explain recent electoral successes of populist parties in Europe. Germany’s populist, right-wing party Alternative for Germany made decisive gains in the recent regional elections and won 12.5 percent in the state of Rhineland-Pfalz, 15 percent in Baden-Württemberg, and 24 percent in Saxony-Anhalt. In particular, AfD has rapidly gained popularity amid a deteriorating situation with refugees in Germany. The party is advocating for a stricter migration policy and proposes alternative, tough, ways to resolve the current crisis. “The refugee crisis and especially the way our society deals with it, unfortunately, totally confirms analyzes and theories that I have tried in my book. I think the refugee crisis is ultimately less important with respect to the financial or demographic influence it has on the individual countries; the most important finding, I believe, is rather the apparent inability of our political elite to deal with this crisis in a democratic way,” Engels said. According to the expert, the inability of the EU to resolve the crisis demonstrates strong democratic deficit in European states. It also shows that Europeans are unable to engage in a dialogue and work out a common strategy, the expert argued. “Today, as 2000 years ago in Rome, our society suffers from far too sophisticated structure of our state institutions. Our countries have made themselves so complicated that it’s become impossible to handle important issues [..]. Such endeavor would only be possible in case of a common, long-planned reform of our entire society. But that would certainly be difficult to implement given the current, very short-term thinking and mutually blocking political institutions,” the expert stated.